The Edgewater Hotel is in the heart of Put-in-Bay on Delaware Avenue. In 1999, this prime lodging option finished construction. Moreover, this space was recently renovated. The Edgewater Hotel features rooms and suites next to the Put-in-Bay Nightlife. The beautiful DeRivera Park is across the street. Also, the public docks and Jet Express terminal are a short stroll away. Furthermore, the majority of the islands bars, shops and attractions are nearby. Perry’s Victory and International Peace Memorial is also accessible. The island is at your finger tips at Edgewater. The deluxe hotel rooms sleep up to 4 adults. Each features 2 queen size beds, a 27″ color TV with cable, and a bath with double vanities. Luxury Suites sleep up to 6 adults. Rooms feature a full size refrigerator with freezer, microwave and wet-bar. Also there is a kitchenette, 27″ TV with cable, recliner, and queen size sleeper sofas. Lastly, there are 2 queen size beds, and a bath with a separate double vanity. Second floor suites feature a 135-foot wrap-around deck. There is also a 25-foot veranda looking out on the island’s finest view. The downtown Put-In-Bay area, waterfront, and public docks are all within sight. In short, an ideal location. Guests of the Edgewater Hotel enjoy full access to all amenities of the Put-in-Bay Resort. This includes a complimentary continental breakfast. Additionally, guests can use the pool and 40-person Jacuzzi. Come out and beat the heat. A dip in the pool is the perfect way to cool off. Golf cart, bicycle, and moped rentals are available. They rent by the hour, by the day, or overnight. Golf cart rentals often sell out. Guests are encouraged to Reserve Carts. Be sure to not get left out. Golf carts are the preferred mode of transport on Put-in-Bay. 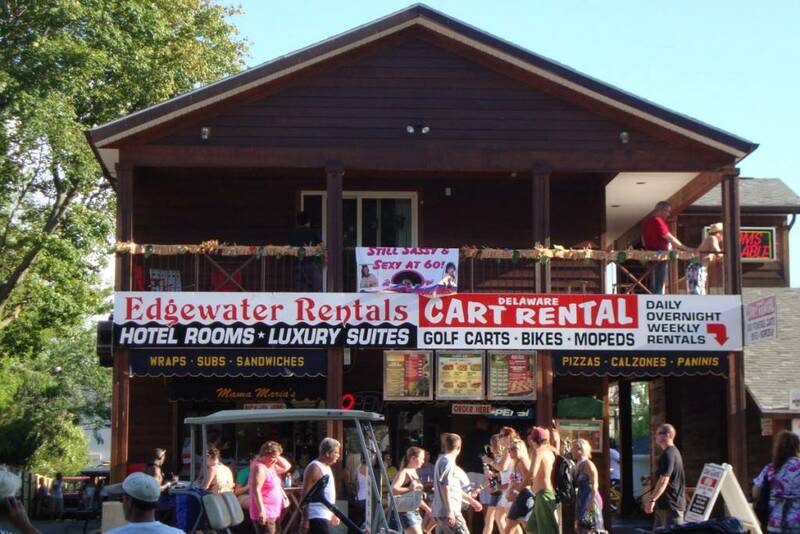 For reservations or additional information about Edgewater Hotel, please call 1-888-PIB-STAY (1-888-742-7829). Otherwise, guests can submit a reservation request online.